The Learning Garden has shaken off winter; the tunnels are uncovered and the bees are out! We've got the field garden chock full of salad greens, some "new" raised beds and a whole host of flowers blooming. 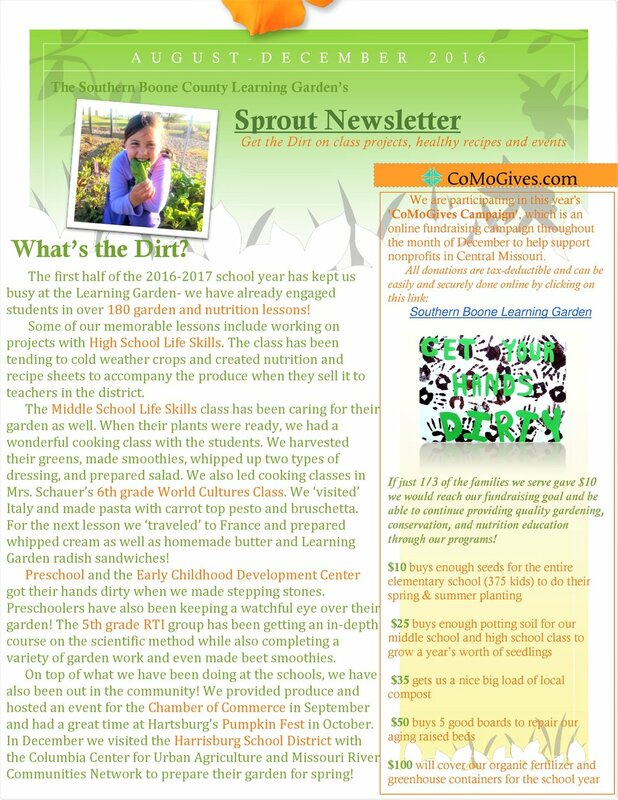 As we shift into high gear we wanted to update all of you on some of what we've been up to since our last newsletter. Pre-K classes spent their March lesson making stepping stones, their April lesson prepping garden beds and planting cool season crops, and in May they will harvest their plants. We waited so long for spring to get here, and now it feels like it's almost over! Spring garden lessons will wrap up in the next two weeks, with more than 80 lessons taught already this semester. In March, all K-5 students started salad crops from seed (thank you Rebekah Hammett and her HS Ag students for helping us care for them in the greenhouse!). In April, they transplanted them in our field garden rows, and in May students will harvest and enjoy the end result of their efforts! Once a month, the Learning Garden joined Ms. Schauer's two 6th grade World Cultures classes for a cooking lesson! Using SBLG produce, students connected the cultures they learned about to their plates. During the Asia unit, we made Vietnamese spring rolls, while studying Europe we made French radish, sea salt and herb butter sandwiches, and for Latin America, homemade tortillas! The final lessons of the year took place in the greenhouse, where we transplanted crops to bring the lessons full circle. Garden Club so far this spring has been a wild success! We have our largest groups to date, and have somehow managed to avoid the rain each week! Students have expanded upon their in-class gardening knowledge by preparing hoop houses for spring, planting potatoes, and even developing basic greenhouse skills. We've also had many visitors and guest volunteers during these sessions, including Mayor Gene Rhorer for the Mayor's Day of Recognition for National Service. Students witnessed a mayoral proclamation, and Sarah and Andrew received letters of thanks for their service. Thank you to the Girl Scouts of Southern Boone for all of your hard work on Earth Day! 53 scouts and 20 volunteers created new raised beds, repaired existing beds, painted rain barrels, and filled the garden with beautiful flowers as part of their work day. A big thanks to Hy-Vee, Strawberry Hill Farms, and Home Depot for your respective donations for this event as well! Join us in the Learning Garden on Saturday, May 30th, for our second annual Dine in the Dirt fundraising dinner! This year, we are excited to partner with Opaa! Food Management, Inc! Together, we'll be serving a springtime meal that showcases Learning Garden veggies, as well as local beef, cheese, eggs, honey, and mushrooms. Suggested donation of $20 for adult attendees, $10 for children. Funds raised will help us continue to provide enriching, garden-based education to Southern Boone students. We hope you'll come spend an evening in the garden with us this spring! Please help us welcome our newest board member, Theresa Lackey! Theresa has jumped right in by volunteering with Garden Club, repotting veggie seedlings for sale, and helping us promote our work in the community! As we welcome Theresa, we also say goodbye to two outgoing board members, Missy Bonderer and Sue Haugen. Thank you both for your years of service and commitment to the Learning Garden! From all of us at the Learning Garden, we wish you and your family "Happy Holidays". We had an amazing year in 2014 at the garden and can't wait to get 2015 going! Over 850 Southern Boone students enjoyed a monthly visit to the Learning Garden! Over 140 garden lessons taught to all of the district's pre-K through fifth grade! Each class got to plant an entire row in the field garden totaling 33 rows of cool-season crops! Sweet potatoes from a 300 pound harvest were used in school meals at all four district schools! Pre-k got to build scarecrows out of empty cans to hang beside the beds at the pre-k. They named them Easter, Bunny, Rose, and Flower. Kindergarteners got to use their five senses to explore Fall in the Learning Garden. First graders practiced in-class addition skills in an outdoor setting by searching for and solving math problems in the garden. Second graders connected garden work to social studies by learning about the importance of corn in the Pilgrims' diet, and in our modern diet. They even ground their own corn! Third graders practiced mapmaking in the Learning Garden, and used their maps of the raised beds to hunt for treasure. Fourth graders practiced their creative writing skills while imagining they were suddenly smaller than their Kohlrabi plants and stuck in the garden. Fifth graders brought their knowledge of the scientific method outside and conducted a hands-on, two-month science experiment comparing the effects of compost and synthetic fertilizer on plant growth. Starting this past Fall semester the Primary School invited the Learning Garden to lead a group of 2nd graders for WIN time. The students in our group helped maintain and prep the garden for winter as well as perform a long-term scientific experiment involving radishes in small pots (hopefully that sounds familiar to some of you parents). Although this semester was the first time the garden was involved with WIN time we consider our involvement a success. Sarah and Andrew had a great time working with all the students and working through the challenges associated with additional content planning. The students had a great time and, most importantly, got a substantial amount of extra time in the garden to learn, explore, discover and taste. We can't wait to get started with new students next semester! It may be a few seasons before we have much of a harvest, but the Learning Garden will soon be overflowing with apples, cherries, and blueberries. Pictured: Cami reading to Sidney what kind of tree they're looking at. Pictured: Lilah, Addison, Brayden, and Brooklyn exploring the new orchard at the Learning Garden. If you still need to winterize your garden and maybe a little unsure as to what you should do, here are a few things we did at the Learning Garden. We wrapped the hoop houses in plastic. Wrapping the hoop houses in plastic effectively turns them into passive-solar green houses, acting as the primary barrier for the plants against winter weather. Keep in mind they will need venting on the sunny days to help regulate the temperature. We covered the rows with row cover. Both the rows inside the hoop houses and the entire field garden. This can make watering a little difficult, but may be the difference between your cold crops surviving the winter and not. We planted cover crops. We planted Austrian winter peas, forage collards, and tillage radishes in the raised beds to grow over the winter. Planting cover crops can (among other things) aerate the soil, improve water retention, protect against erosion and maintain nutrients. The Southern Boone Learning Garden now has a new board member, Mark Zacher, and also a new Chair, Laura Redfield-Jacobs. Mark and his friend (alter-ego), Chef Z, have been volunteers at the Learning Garden and other mid-Missouri schools for many years. Mark brings a fun and fresh personality to the Learning Garden. Laura, a Master Gardener and active volunteer, is the newest Chair and brings with her a wealth of gardening knowledge as well as experience serving on other boards. Grate onion and sweet potatoes in a fine strainer. Squeeze out as much liquid as possible. In a large bowl, mix together grated ingredients, flour, and eggs until well combined. Season with salt and pepper. Heat vegetables oil in large skillet over medium heat. Using a large spoon, scoop batter into oil in 3-inch pancakes. Fry 3 to 4 minutes per side until brown. The Southern Boone Learning Garden took outdoor education to new heights last year! During the 2013-2014 school year, we taught over 240 garden lessons to more than 750 students in the Southern Boone School District. Students cultivated math, language, science, creativity, and problem solving skills all while having a blast outdoors in the garden! This semester, students will again be exercising their green thumbs during school-day lessons. Each grade level will be planting a different fall crop to grow and then enjoy during lunch in the school cafeteria. We are very excited to partner with OPAA! Food Management to bring more of this tasty produce from the Learning Garden to the school kitchens. We are also eager to continue working with the high school special education and agriculture departments, and to expand middle school programming at our newer garden sites. Bug and scavenger hunts galore! Healthy human body and yoga in the garden! Mr. Worm being cradled by Adeline Rhoads in the Learning Garden during summer school. Currently, Mr. Worm is healthy, happy and excited to visit with Adeline when she returns to the garden. Introducing your 2014-2015 Garden Educators! Sarah just can’t stay away from the Learning Garden! After over a year of working with SBLG as an intern, Garden Club leader, school-day teacher, and general Jill-of-all-trades, she’s thrilled to be sticking around for another as an AmeriCorps volunteer. This Columbia native loves chickens, bees, books, knitting, bluegrass music, Huckleberry Finn (and anything else of Missouri origin). She’s looking forward to four more seasons of exploration, growth, and shoe muddying with the kiddos of Southern Boone! Andrew comes to Southern Boone all the way from the Pacific Northwest! This Eagle Scout brings with him a newly minted degree in Environmental Science from Portland State University, and an interest in the inquiry method of outdoor education. Andrew enjoys photography, discovering new music, camping, and woodworking. He’s still figuring out this whole Midwest thing, and though he’s generally impressed, he could do without the humidity. Carlee Myers and Isabella Finnegan demonstrating how to eat cucumbers, tomatoes and squash from the Learning Garden. They effectively ran the booth at the Coyote Farmer's Market, hawking our vegetables to the good Ashlandians. Elementary parents, keep an eye out for our fall Garden Club application! We’re looking forward to spending another semester outside learning about gardening, trying new foods, and having fun! Garden Club students will meet on either Wednesdays from 2:30-4:30 or Thursdays from 3:30-5:30. Jacob Bowles, Kale Nichols and Dillon Ozenberger breaking a sweat in Garden Club. The boys were turning compost for the Learning Garden. Our newest after-school venture is a cooking program hosted by Chef Z (alternately, Mark Zacher). A longtime SBLG volunteer and member of Slow Food Katy Trail, Chef Z will teach 7th and 8th graders how to prepare and cook healthy foods. When possible, Chef will incorporate foods harvested from the Learning Garden. If you're interested in learning more about Cooking From The Garden or the Slow Food movement, please contact Mark at mdzacher@gmail.com. Chef Z (Mark Zacher) showing some kids how to cook food they harvest from the garden. Garden Manager Kelly Redford hangs up a freshly painted welcome sign in preparation for another school year. Garden Educator Andrew Kent's view of the Learning Garden after a long and arduous trek up Mulch Mountain. Spread tomatoes on baking sheet, drizzle with 2 tbsp oil, season with salt and pepper. Transfer to oven and roast 10-15 min. Using a mandoline or julienne peeler, cut zucchini into thin strips. Heat a large skillet over medium heat. When hot add remaining oil, onions, and garlic, and cook until fragrant. Add zucchini noodles and roasted tomatoes. Saute a few more minutes, sprinkle with cheese, and enjoy! Copyright 2014 Southern Boone Learning Garden, All rights reserved.